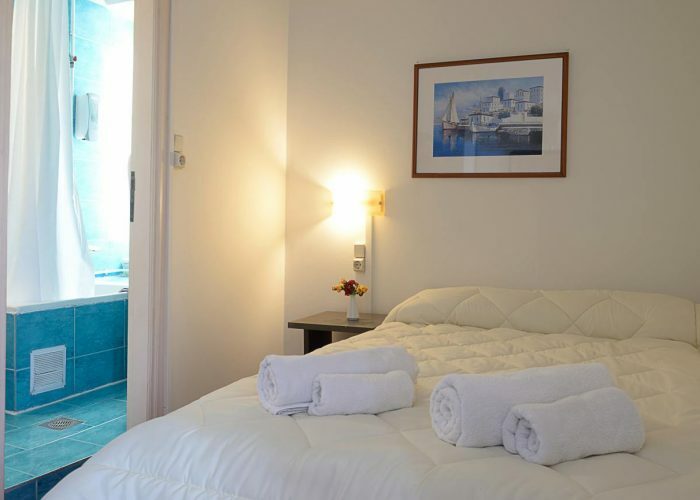 Our hotel disposes 31 fully equipped and rennovated rooms. 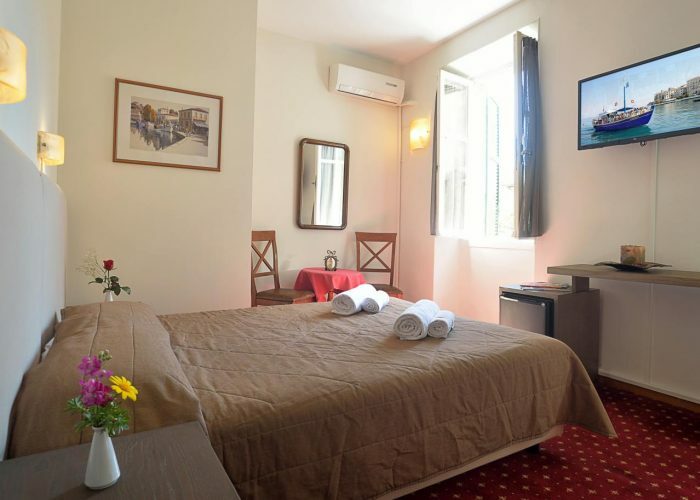 Due to our vast variety of room types, we can host any type of guests, either families or solo travellers visiting Corfu on a business trip. Our rooms provide all the necessary amenities which guarantee a comfortable stay, like air-conditioning, 32″ TV, free Wi-Fi, fridge etc. 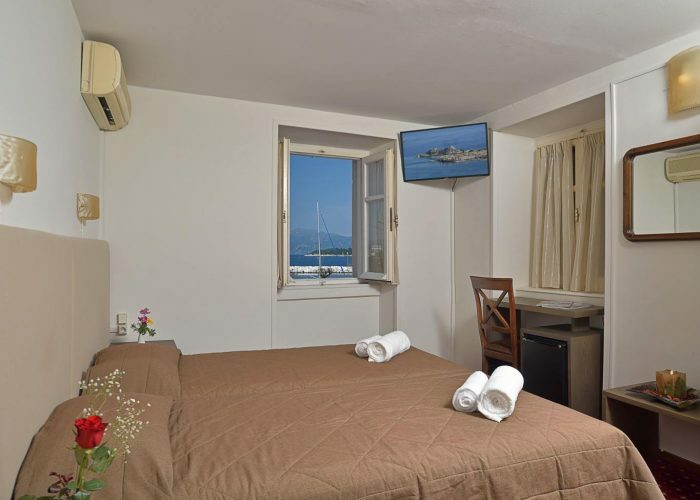 Hotel Konstantinoupolis’s major advantage is its convenient location in the Old Harbour near to all places of interest in Corfu town, as well as the airport. 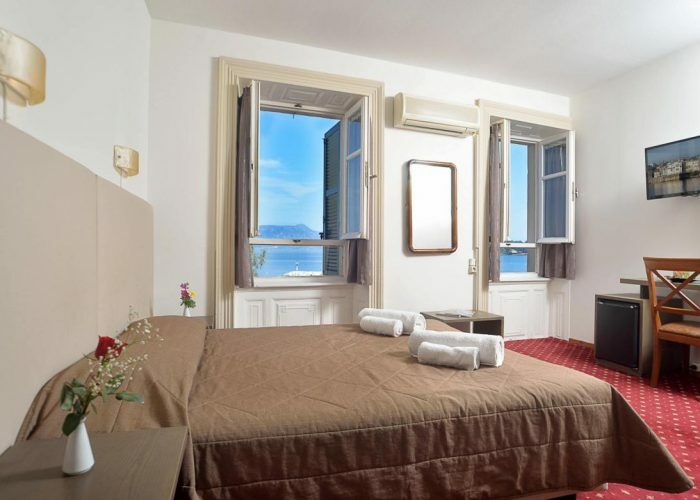 Due to this fact the hotel is the ideal option of accommodation in Corfu comparing to other Corfu hotels. Small single room between 12-13 m2 (real feel 10m2) equipped with 1 semi double bed 135×192 cm, private bath, hairdryer, kettle, air conditioning, T/V 32”, fridge and free WI-FI. This room faces a small alley without balcony. Double room between 13-15m2 (real feel 11m2), equipped with 1 double bed 145x192cm, private bath, hairdryer, kettle, air conditioning, T/V32”, fridge and free WI-FI. This room faces the Old Harbor but without balcony. 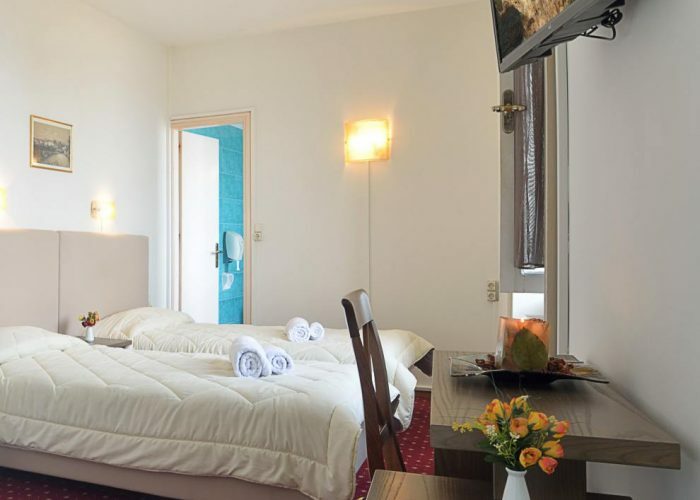 Twin room between 12-15 m2 equipped with 2 single beds 95x192cm, private bath, air conditioning, kettle, hairdryer, T/V 32”, fridge and free WI-FI. This room faces the Old Harbor but without balcony. 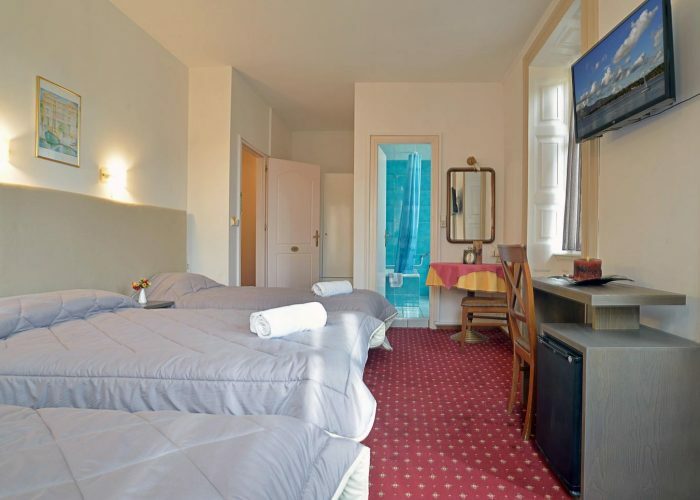 Twin room between 16m2 equipped with 2 single beds 95x192cm, private bath, air conditioning, kettle, hairdryer ,air conditioning, T/V32”, fridge and free WI-FI. This room faces the Old Harbor with balcony. 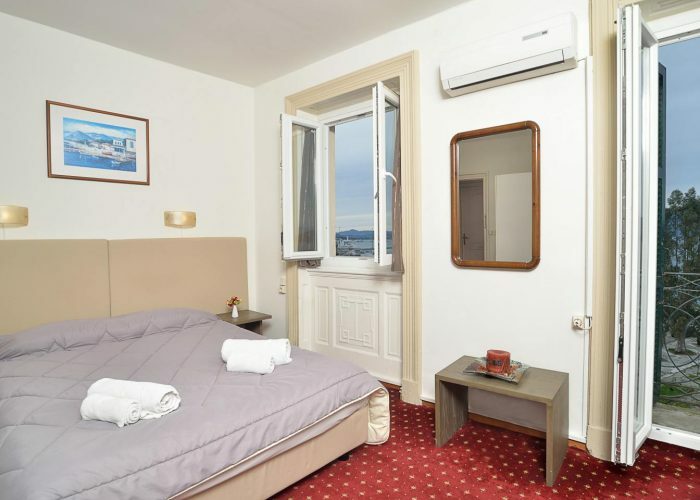 Double room between 13-15 m2 equipped with 1 double bed 145×192 cm, private bath, hairdryer, kettle, ,air conditioning, T/V 32”, fridge and free WI-FI. This room faces the Old Harbor with balcony. Triple room between 16-17 m2 equipped with 3 single beds 95×192 cm, private bath, hairdryer, kettle, air conditioning, T/V 32”, fridge and free WI-FI. This room faces the Old Harbor, with balcony. Triple room between 22-24m2 equipped with 2 single beds 95×192 cm and 1 single 115 x 192 private bath, hairdryer, kettle, air conditioning, T/V 32”, fridge and free WI-FI. This room has side harbor view with big balcony. 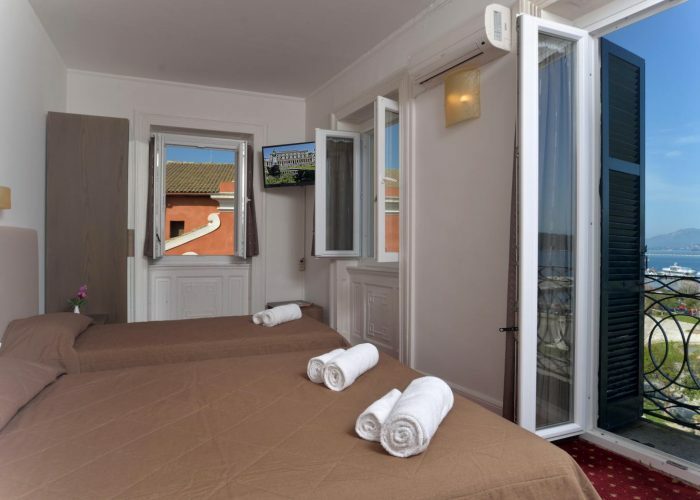 Triple room 18m2 equipped with 1 double bed 145×192 cm and 1 single 95×192 cm, private bath, kettle, hairdryer, air conditioning, T/V 32”, fridge and free WI-FI. This room faces the Old Harbor with balcony. Triple room 18m2 equipped with 1 double bed 145×192 cm and 1 single 95×192 cm, private bath, kettle, hairdryer , air conditioning, T/V32”, fridge and free WI-FI. This room faces the Old Harbor without balcony.